The building is thus classified ‘Nearly Zero Energy’. The two floors of the new building are characterised by a central ‘street’ which acts as the main communication channel. 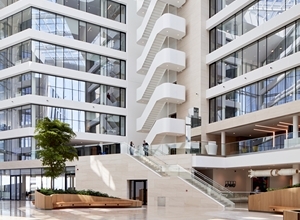 physical and visual communication has been encouraged through the use not only of the wide open spaces, but by the wide open plan staircases joining the two levels. The independent grouping of independent healthcare mutual societies MLOZ, recently made a major change to their office premises. 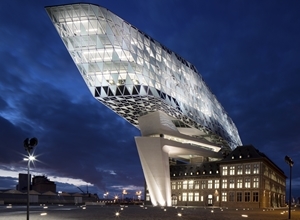 They are now located on the Route de Lennik in Anderlecht, in the vicinity of the Erasmus hospital. 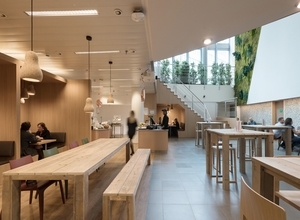 To pilot this major evolution, MLOZ (Mutualités Libres / Onafhankelijk Ziekenfonds ) called on the services of real estate advisor Colliers International. Joint interview of Réginald de le Vingne, Real Estate and Insurance Manager at MLOZ, and Thomas Simon, Senior Project Manager at Colliers International.to understand the challenges and success of this real state and HR project. The process started by a ‘stay or leave’ analysis. 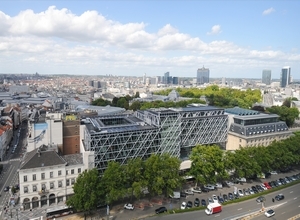 The result was that either they had to select another building than their current location in Brussels, located close to Montgomery, or construct a new building. The second option was chosen, close to the Erasme hospital opposite an existing building occupied by another service operating in the mutual societies domain. Colliers then set up an architectural competition, looking for an overall team to include a study bureau, architect, engineers, acoustics… These would be allied to a contractor and would be able to carry out the entire construction process, without the interior fit-out. A team led by BEAI architects and CFE/Herpain was selected, and Colliers was asked to act as project manager right up to delivery. On the environmental front, the building is supplied with heat and cooling by a geo-thermal system with 23 probes reaching 57 metres down into the ground. This provides 14°C of temperature which enables the energy needed for heating and cooling to be significantly reduced. The building is thus classified ‘Nearly Zero Energy’. 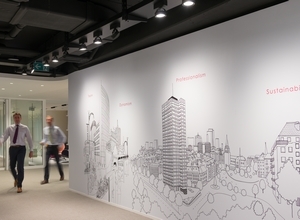 At the end of the construction works, MLOZ asked also Colliers to take charge of the interior design and fit-out of the new building but mandated also them to re-fit of the building opposite in a similar style, its tenant having now been merged into MLOZ. This work is ongoing, and includes the displacement of the personnel as necessary in phases. 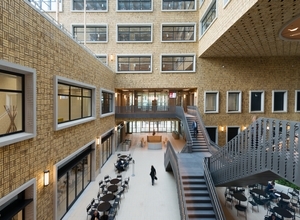 The two floors of the new building are characterised by a central ‘street’ which acts as the main communication channel. Four ‘wings’ run off from this street, with open working areas, and each has a specific colour treatment. The colour scheme is otherwise largely white, which gives a further feeling of openness to the entire complex. Copy corners enable the members of staff to print documents by logging in with their own badge, at whichever copy corner they select. The machine recognises the person and if, for example, it is a scan which has been requested, this is automatically sent to the screen at the workstation where the person has also logged in that morning. For a print, the member of staff can tell the system at which printing machine the document should be printed. This is called ‘follow-me printing’. The meeting rooms are equipped with an electronic screen at the door, showing the schedule for the day. All is controlled from an ‘Evoko’ central management system. And if, for example, a meeting room has been booked but is not used within ten minutes of the time, the reservation is automatically cancelled on the screen. The Real Estate and Insurance Manager at MLOZ, Réginald de le Vingne, explains how the project was instigated internally. The desire was to enable the personnel to participate in the process as much as possible. This was in large part because the change in the working environment was likely to be substantial, and it was important that the personnel felt happy with the new arrangements. The previous building had to become too constraining, and was laid out in the traditional manner, with a high proportion of closed offices. So they started looking at what they needed on a daily basis, and asking the personnel how they envisaged their working environment. Réginald de le Vingne “We really wanted to adopt the ‘New Way of Working’, which represents a major turning point for a mutual body such as us. These bodies often have a rather dull image, a bit like a ministry or civil service department, so we wanted to bring a new stimulus, a new dynamic, to the whole of the personnel”. MLOZ also realised that there was a great deal of interaction between departments, and this was not easy in the existing building. The new building enabled more collaboration between the different services. 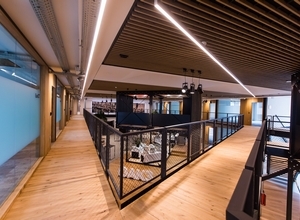 It is clear that physical and visual communication has been encouraged through the use not only of the wide open spaces, but by the wide open plan staircases joining the two levels. Along with the new office arrangements, MLOZ introduced new working practices including different time schedules and home working (up to 2 days a week). The personnel are very happy with the new arrangements, especially as they played such a part in designing them. The management attempted to respond to as many of their wishes and desires as possible, and asked everyone to throw their ideas into the pot. This was a sort of brainstorming pushed to new frontiers. Réginald de le Vingne details: “We asked them – what would you like, how do you see your working environment, how do you want to work, what do you think about what you have now, what do you think about the concept we are moving towards”? The final result was that the personnel were satisfied because a majority of their ideas had been integrated – although quite clearly not every single one of them. In fact, MLOZ went through two stages of evolution in one move. They changed from closed offices to flex-desk without passing through the stage of traditional open space. “We had some open space before, but badly laid out, and open space in name only!” Réginald de le Vingne states. 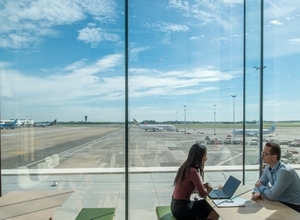 In the new building, even if departments tend to base themselves in one or another of the wings, people still go and sit in another wing from time to time, either because there is something to be done there, or because their ‘own’ wing is fully occupied. 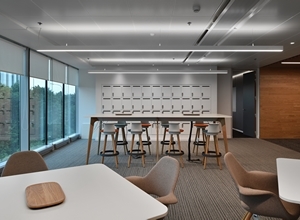 On this last point, MLOZ has adopted the current trend for flexible and shared workplaces of having fewer work stations than members of staff. In this case, the proportion is 70%. Some functions, of course, need to be in a fixed location because of the sheer volume of work. So what’s next? Réginald de le Vingne is realistic and knows that there are always teething problems with a new system, so MLOZ will anticipate these and deal with them. Following this, the second building will be completed, and as Thomas Simon confirms, the objective is to achieve the same working environment so that the two populations really are merged together, even though the two buildings are different. The mutual societies which make up MLOZ are very happy with the outcome, and it may well be that some of them follow a similar style when they re-fit their own offices, or move.